Highlight an achievement or congratulate a friend or family member using this Walnut Executive Desk Wedge. Your message is laser engraved into a metal name plate that is attached to the surface of this desk wedge to create a memorable and everlasting impression. Shipping Weight: Shipping Weight: 12.5 oz. Shipping Weight: Shipping Weight: 13 oz. Wedge Size: 12.5 inches (length) x 1.75 inches (height) x 2.25 inches (depth). Final products may vary slightly from the weights and measurements shown. Make a lasting impression with a desk wedge by engraving it with a name and title, an accolade, or an inspirational thought. If your logo file is unavailable with mobile access, it will need to be emailed, with reference to your order, to nametag@nametag.com before your order can be processed. PRICE INCLUDES: 2x8 inch or 2x10 inch engraved name plate with up to two lines of engraved text. SET-UP FEE: $10.00 per logo (initial order only). 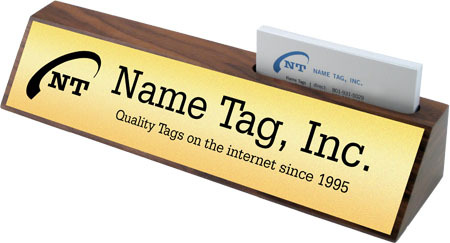 No set-up fee is required for name plates without a logo.